It's Throwback Thursday with My Creative Time! Time to pull out those older MCT sets and make a fun project! For my card today I used one of my favorite banners dies from the Stitched Party Die set. I also used one of all-time favorite staples: Stitched Rectangular Frame Dies & More. 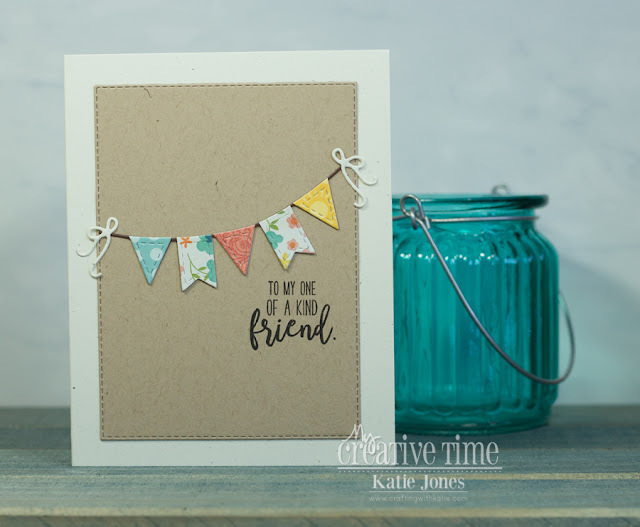 I paired these with a sentiment from one of our newer sets: Springtime Smiles. I just love the font combination in this set! OMG Miss Katie What a Sweet and Beautiful Card. Love your banner!! Love too the beautiful paper you chose...sure make for Spectacular look!! Lovin' too the Kraft as it so showcases your Fabulous Banner. Great job spreading the Craftabulous inspiration using Miss Emma's Awesome goodies. You so did a Super Outstanding Creative job!! YOU so ROCK! !